Wärtsilä said it has taken a further important step toward developing its Smart Marine capabilities by successfully testing the remote control of ship operations. The testing, which involved driving the vessel through a sequence of manoeuvres using a combination of Dynamic Positioning (DP) and manual joystick control, was carried out on August 21 off the North Sea coast of Scotland in collaboration with Gulfmark Offshore, the U.S. based operator who provided the vessel for the project. 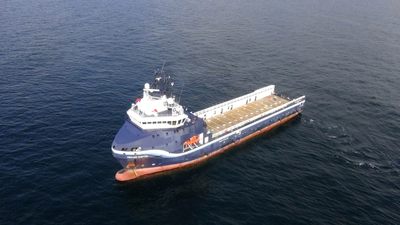 Although the test vessel was in the North Sea, the remote control navigating was carried out from the Wärtsilä office located in San Diego, California, 8000 km (5000 miles) away. Wärtsilä's Dynamic Positioning unit developed remote control capabilities in the early part of 2016, but this was the first test carried out on an offshore vessel. The vessel, the 'Highland Chieftain' is an 80 metre platform supply vessel already fitted with a Wärtsilä Nacos Platinum package for Navigation, Automation and Dynamic Positioning systems, as well as a Wärtsilä drives package. For the test, additional software was temporarily added to the DP system in order to route data over the vessel's satellite link to the onshore work station in California. Most importantly, the Wärtsilä testing was carried out using standard bandwidth onboard satellite communication. No land-based technology was used for the communications between the vessel and the remote operator work station. The retrofitting of the DP software was completed within just 30 hours and with minimal inconvenience, thanks to Wärtsilä's modular and easily upgradable system. The successful test was conducted over an almost 4 hour period during which time the vessel was driven through a series of manoeuvres at both high and low speeds. All the test procedures carried out went as planned. "Wärtsilä is committed to developing technologies that enable a Smart Marine future. In the age of digitalisation, the future Smart Marine ecosystem will involve connecting 'smart' vessels with 'smart' ports to enable an even more efficient use of resources. It will also reduce the impact on climate while enhancing safety," says Roger Holm, President, Wärtsilä Marine Solutions. Andrea Morgante, Head of Digital, Wärtsilä Marine Solutions adds: "One of the first and most critical hurdles to overcome along the path to the enablement of intelligent shipping is to develop efficient and reliable remote control and monitoring capabilities, taking factors such as bandwidth limitations and cyber security into consideration. This test provides a clear indication that we are well on the way to achieving this. The fact that the ship was enabled for remote operation in only a few hours is a strong endorsement of Wärtsilä's position at the forefront of marine technology development. At Wärtsilä, we are fully engaged in developing 'intelligent' vessels since we consider such technologies to be vital to maintaining a profitable future for our customers." It is anticipated that Wärtsilä's development of successful remote access to ships will also enable virtual service solutions to customers needing tuning or testing of their DP systems. Furthermore, this solution will be used for other pilot projects, such as automated docking procedures. "At Gulfmark Offshore, we believe that it is important to embrace new technologies since they represent the future of our industry. If companies are to remain competitive they must look ahead and take advantage of the tremendous development work being done by companies such as Wärtsilä. For this reason, we are most happy to cooperate with Wärtsilä in this exciting project," says Ashley Robinson, SVP Operations Gulfmark. Wärtsilä has earlier supplied three of Gulfmark Offshore's 'Highland series' vessels with various products, systems and solutions, as well as DP systems to several other vessel series within the company's fleet.